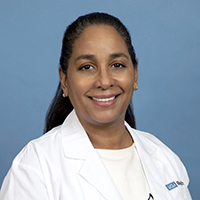 Dr. Zenaida Feliciano is a cardiologist and cardiac electrophysiologist who has served on the UCLA School of Medicine faculty since 1994 when she joined the Department of Medicine/Division of Cardiology. She graduated high school having just turned sixteen and earned her Chemistry BS in 1983 and her M.D. degree in 1987 at the University of Puerto Rico. After graduating from medical school she came to the mainland United States for her medical training. She started her training at Tulane University and finished it at University of Maryland, training from 1987 to 1994 in internal medicine, cardiology and cardiac electrophysiology. Dr. Feliciano was recruited by and has been part of the UCLA's Cardiology Department since 1994. She is an Associate Professor of Medicine at the Geffen School of Medicine at UCLA and has been Co-director of the electrophysiology section at the UCLA Medical Center from 1995-2002 and at the VA Greater Los Angeles Healthcare System from 2002 to the present. She is the Associate Director of the Fellowship in Cardiovascular Medicine and Director of the ECG/Holter/Treadmill Laboratory at the VA Greater Los Angeles Healthcare System. Dr. Feliciano has been with the American Heart Association, Latino Task force since the year 2000 and has been the chairperson for the task force for the last 3 years.